Is there any other tourist destination in Japan that have more visitors than the tallest tower in the world, Tokyo Sky Tree, have in this year? 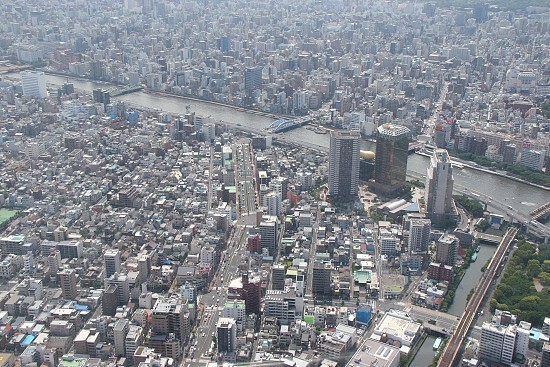 I doubt about that, since this giant structure located in the Sumida, Tokyo, really cast its appeal to all of residents of Japan, and even to the whole world. Since the opening day, which was on 22 May 2012, Tokyo Sky Tree has been being visited by thousand of people on each day, whether those guys who were really lucky to get their hands on a Tokyo Sky Tree entrance ticket or for those guys who were not lucky enough so they could only do some sightseeing. Believe it or not, there were still thousand of people hanging around the Tokyo Sky Tree in the rainy days. Now, let’s go to explore more about this place since maybe you guys have been curious enough about what this mega structure has to offer. Let’s off! 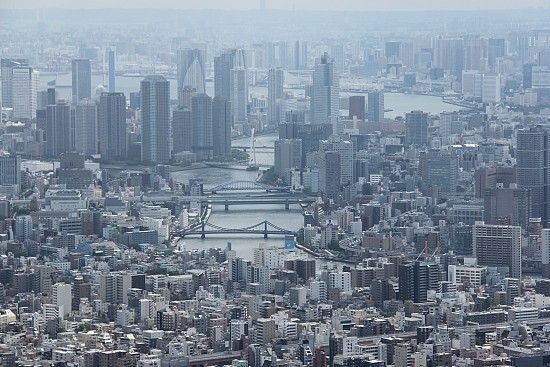 The construction of Tokyo Sky Tree was started on 14 July 2008 and it took almost 4 years for it to be completed, which was on 29 February 2012. We could see that this Tokyo Sky Tree, that was developed by Tobu Railway, was a serious project cost about 65 billion JPY or as much as US$806 million. With Nikken Sekkei as the architecture, this free-standing broadcast tower has its own distinct look compared to the other towers because of its unique round-shape and the body of the tower that would make it looks like puzzles. Located in the Sumida, which is in the north side of Tokyo, Tokyo Sky Tree has its own station named Tokyo Sky Tree Station and we could get there by train easily from the Asakusa station. Tokyo Sky Tree is really visible from around the neighbourhood since it is 634 metre high and make it even easier for the visitors who choose to go by foot to the Tokyo Sky Tree. At the time when I was in Japan, I went to the Tokyo Sky Tree twice, but the first time I was there it was raining and made me lose my desire to go up there. 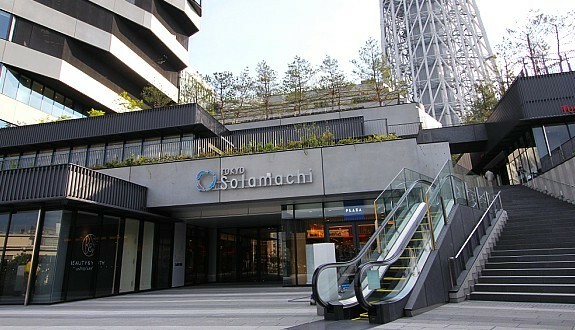 Anyway, in order to go to the Sky Tree we have to enter from the department store located on the bottom of Sky Tree, which is Solamachi, then we have to go to the 4th floors of Solamachi. At the time I was there, we had to take a ticket from the officials standing outside the building and on the ticket written the time when you could enter the tower. I don’t know how it is working now, but before we couldn’t enter the tower immediately and had to wait because there were thousand of people who were also waiting to get inside. Back then, I arrived in the Sky Tree at 12 and I got the ticket for 3.30, so I had to wait for 4 hours to enter the Sky Tree. Fortunately, there is Solamachi on the bottom of Tokyo Sky Tree where we could go there to killing some time. Solamachi that literally means Sky Town is a large department store where there are lots of restaurants, food court, food market, cafes, and stores selling lots of stuffs, from souvenirs to toys. 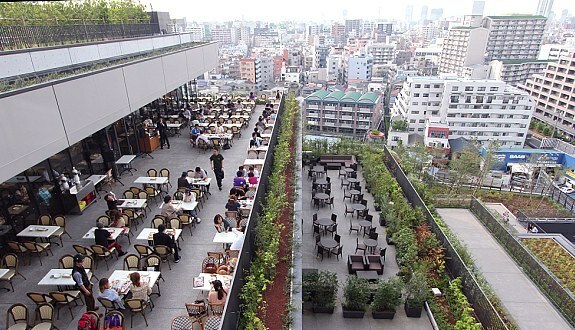 Solamachi also offers you an amazing outdoor dining experience, where you could have your meals while watching the skyscrapers surrounding the area. 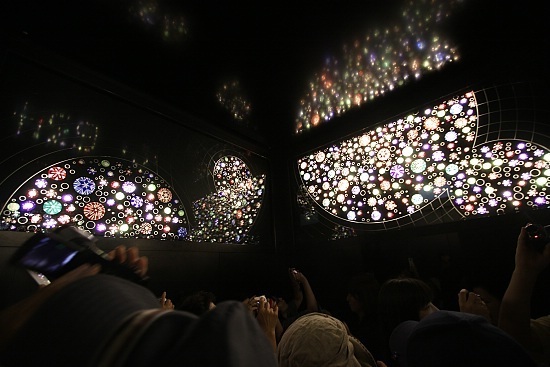 Sumida Aquarium and Tenku Planetarium are also located inside this very Solamachi, you could spend your spare time there by watching lots of beautiful fish inside the giant size of aquarium or be hypnotized by the beautiful stars dancing in the sky in the planetarium. 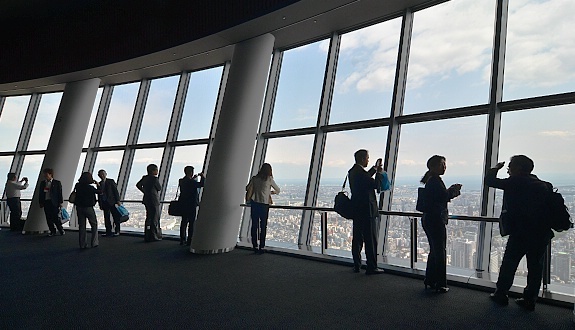 On you’re arrive at the Tembo Deck, that is consisted of 3 level of floors, you would be served with the enchanting view of congested city of Tokyo. On the top floor of Tembo Deck, you would be able to see the surrounding neighbourhood through the tall, broad window that spans 360 degree of room. With this 350 metre high Tembo Deck, you could see the Tokyo Tower, Tokyo Metropolitan Government Building, and the other landmark in Tokyo clearly. On the second floor of Tembo Deck, there are also a souvenir shop and a French-Japanese fusion cuisine restaurant name Musashi Sky Restaurant where you could have a wonderful dining-in-the-sky experience. Another thing that you would find out in almost every high towers is the glass floor and looks like Tokyo Sky Tree didn’t forget to insert this one element on the first floor of Tembo Deck. It would be really scary to look down at the ground from 350 high. Still not enough for you? Don’t worry, Tokyo Sky Tree still have something that’s more breath-taking for those who want more. From this Tembo Deck, there are another elevators connect you to the 450 metre high Tembo Gallery. Once you’ve taken the elevator, you would arrive at the spiral ramp that circles around the tower. This 450 metre Tembo Gallery is dubbed “the world’s highest skywalk” and you could make your walk-in-the-sky dream come true inside this ramp. 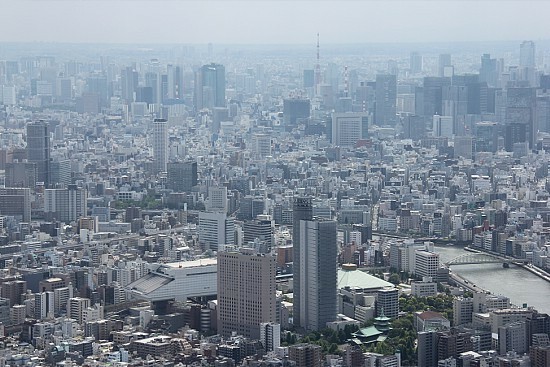 At the end of the Tembo Gallery there is another observation deck offers higher and greater view of Tokyo. 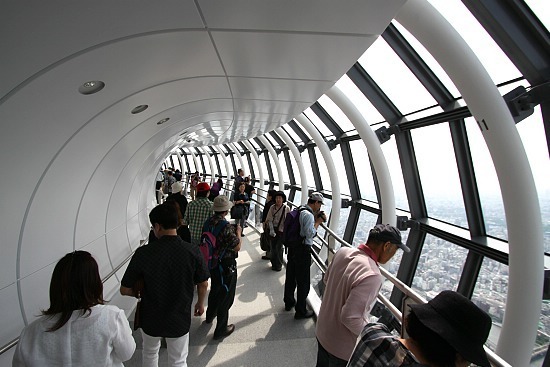 This observation deck is located at 451.2 metre and it is the highest point of observation deck. 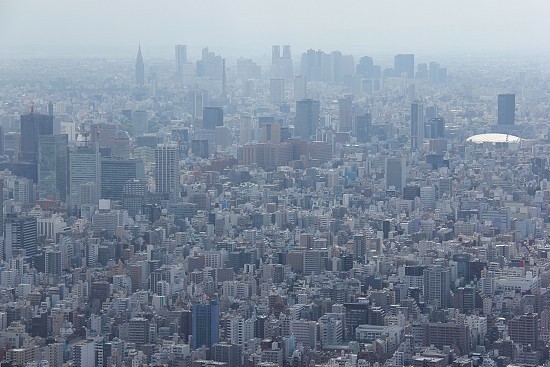 From this height you could see a fast expanse of Metropolitan Tokyo. This is the exact place for you to watch the greatest of the ever-changing Tokyo’s view, throughout the day and watch the charm of four seasons in Japan. I guess, it is a must to go to Tokyo Sky Tree to see the true grandeur of Tokyo and feel how magnificent it is to be in the blue sky. A 500 yen service fee is charged for time specific advance reservations. 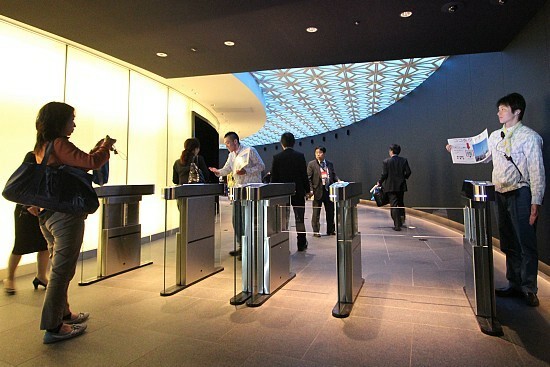 Advance reservations through “TOKYO SKYTREE Web Ticket (The link will be in Japanese only)” with the day/time assigned. 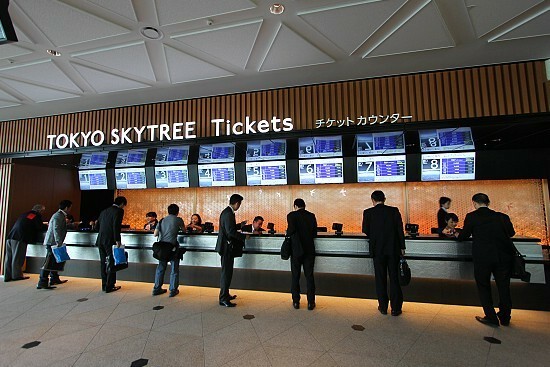 [From July 11]Purchase day tickets at the “TOKYO SKYTREE 4th floor Ticket Counter”. * No day tickets will be sold during the Advance Reservation Only period between May 22 and July 10. Use travel plans including admission exchange tickets for the TOKYO SKYTREE TEMBO DECK (the First Observatory) offered by “Travel Agents”. Use accommodation plans, including admission exchange tickets for the TOKYO SKYTREE TEMBO DECK (the first Observatory) offered by the TOKYO SKYTREE official hotel/TOKYO SKYTREE friendship hotel.
! 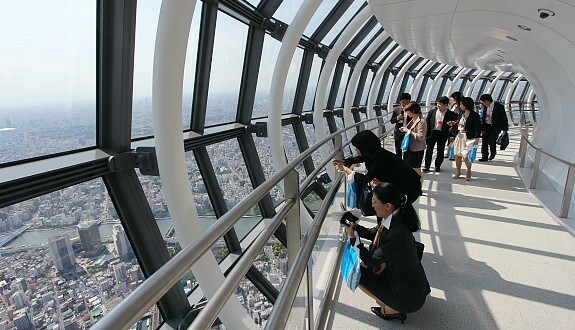 Regardless of the reservation method used, advance reservation tickets are only for the TOKYO SKYTREE TEMBO DECK (350m). Tickets to the TOKYO SKYTREE TEMBO GALLERIA (450m) must be purchased at the Ticket Counter located on the TOKYO SKYTREE TEMBO DECK (350m).